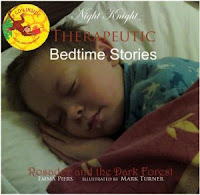 Night Knight: Therapeutic Bedtime Stories is a collection of confident builders for children aged 4 to 12 years of age. The story is a collection of common themes that enable children to better cope with the stresses of life. We follow Rosador and Orion through the tale as they share with the reader how to develop the necessary skills to come to terms with what is bothering them, such as, bereavement, bullying, insecurities and separation. Orion is an elf who has lost his younger brother and his "bad" fairy continues to whisper in his ear, telling him he is not worthy. Rosador is his best friend who helps him through his emotions and together they find a way to cope with their feelings. Along the way the two meet other friends who are going through their own personal "shortcomings", like Fumblekins, the Fulture, whose mother and father have separated and Fumblekins feels like if he was a better son, then his family would still be together. Rosador and Orion help Fumblekins to see that he is remarkable, just the way he is. Each chapter of the story, is a lesson in life and at the end of each chapter, there are loving and guiding words to help young people go to sleep with. Each ending paragraph reinforces the good in all of us, and allows the children to enter their slumber with positive thoughts, instead of negative. The illustrations located throughout the book are done in a child-like and whimsical fashion that only enhance the overall telling of the story. This is a book that can be read again and again, especially when your feeling down, it is sure to pick you up and make you feel the love that is inside all of us. I read this to my wee folks, they may be just a bit too young to understand what I was reading them, but their subconscious heard it and they appeared to be calmer after each reading. I was really impressed with how each chapter ended and to go to sleep with positive thoughts can only be beneficial to all. We are currently going through a bullying issue with our 7 year old daughter, she is being bullied at school and it has been frustrating trying to explain to her why it was happening and when I saw that there was a chapter on bullying, I couldn't wait to share it with her. This book should be read to school aged children during classroom reading and shared with them before they go to bed. The message and lesson that Night Knight: Therapeutic Bedtime Stories has to share is one that should be read by everyone, we have all had at least one of the topics discussed happen to us at one time or another during our lives.